See our review of HP's latest Tablet PC, the tx2000. HP’s tx2000 combines the latest mobile technologies and innovative entertainment features with the convenience of handwriting capture and ultra portability. The next-generation touchscreen is more responsive to your touch and provides a natural handwriting experience. In a sophisticated design featuring the new HP Echo Imprint Finish and a silver keyboard, the tx2000 makes a great impression! Stay connected when traveling, in between classes, while away from the office or wherever your daily life takes you. Carry it anywhere—weighs about 4.3 lbs*. Control media and navigate presentations using the mini remote or your finger. If you thought high performance could only come from a big desktop PC, think again. Improve productivity with the power of a desktop that’s ultra portable. Run multiple applications seamlessly with a speedy, powerful, dual-core processor**** and advanced graphics card. Store your large files, music, videos and photos on the high-capacity hard drive. Enjoy rich graphics on a high-resolution screen. There may be no other PC that’s more “in touch” with what you need than the HP Pavilion tx2000. Simplify your work or entertainment, present marketing slide shows or pictures of your kids, and connect with classmates friends and family. Touch the screen with your finger to navigate websites, select and control media and use any application. Fold back the screen and easily surf in tablet mode with the rechargeable eraser pen or the touch of your finger. Swipe your finger over the optional fingerprint reader to easily access protected data and online accounts. Share your content easily with the touch screen that rotates up to 180˚. Fold the screen into a tablet to jot down notes that can be converted into typed text. Store and access your entertainment in QuickPlay – then access it easily at the touch of a button. The HP Pavilion tx2000 Entertainment Notebook PC delivers simple solutions for a hectic lifestyle in a super portable and sophisticated new design. ** May require 6 cell battery or additional battery not included. *** Wireless access point required and is not included. Wireless Internet use requires separately purchased Internet service contract. **** Dual Core is a new technology designed to improve performance of certain software products. Not all customers or software applications will necessarily benefit from use of this technology. See http://www.microsoft.com/windowsvista/getready/hardwarereqs.mspx and http://www.microsoft.com/windowsvista/getready/capable.mspx for details. Windows Vista Upgrade Advisor can help you determine which features of Windows Vista will run on your computer. To download the tool, visit www.windowsvista.com/upgradeadvisor. Services subject to change without notice. Not all services may be available at time of product launch. Choose the way you would like your HP PC to look. FREE Upgrade to HP Imprint Finish (Echo) + Fingerprint Reader + Webcam + Microphone!! FREE Upgrade to LightScribe SuperMulti 8X DVD+/-RW with Double Layer Support!! Battery life varies depending on product configuration, product model, applications loaded on product, power management setting of product, and product features used by customer. As with all batteries, the battery's maximum capacity decreases with time and usage. Limited software technical support is available only for software preinstalled on the computer by HP/Compaq. I first saw the HP 2710P at Gnomedex 2007. HP had a large presence, both by sponsoring the opening night's reception and with the new products that they were highlighting, one of which was their newest Tablet PC offering for business - the HP2710P. This is a no-nonsense Tablet PC, meant to work as you do and do so in a lightweight, easy to carry case. It's a beautifully finished computer, with a 12.1" widescreen, decent resolution. With this offering, HP has abandoned the touchpad and gone to a very sensitive pointing stick. External 65-watt Smart AC adapter, 6-foot (1.8-meter) power cord included. Total length including external AC adapter is 12 feet (3.66 meter). HP Fast Charge. HP Services offers limited 3-year standard parts and labor warranty, pick-up or carry-in, and toll-free 7 x 24 hardware technical phone support (depending on model); 1-year limited warranty on primary battery. On-site service and warranty upgrades are also available. *Except where noted, all prices are estimated U.S. HP prices. Actual prices from other locations or websites may vary. To download the latest Adobe Acrobat Reader, please go to the Adobe Website. Adobe, the Adobe logo, and Adobe Acrobat Reader are trademarks of Adobe Systems Incorporated. 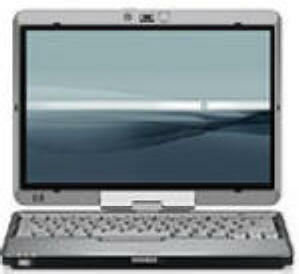 † Not all Windows Vista features are available for use on all Windows Vista Capable PCs. All Windows Vista Capable PCs will run the core experiences of Windows Vista, such as innovations in organizing and finding information, security, and reliability. Some features available in premium editions of Windows Vista -- like the new Windows Aero™ user interface -- require advanced or additional hardware. Check www.windowsvista.com/getready for details. Certain Windows Vista product features require advanced or additional hardware. See http://www.microsoft.com/windowsvista/getready/hardwarereqs.mspx and http://www.microsoft.com/windowsvista/getready/capable.mspx for details. Windows Vista Upgrade Advisor can help you determine which features of Windows Vista will run on your computer. To download the tool, visit www.windowsvista.com/upgradeadvisor. I had the privilege of seeing this model during an interview with some of HP's Tablet team at the Consumer Electronics show. Boasting a 12.1" screen, it's a new member of HP's Tablet PC family that already includes Tablet's only hybrid model as well as a rugged model suitable for use almost anywhere. The HP Compaq tc4200 Tablet PC is a full-function PC delivering performance and compatibility in an innovative form factor, while simplifying your computing needs with the added convenience of handwriting. The light and stylish design is meant for mobile professionals needing powerful and highly-mobile computers that also offer enhanced security and reliability. IT managers will value the full portfolio of integrated security options, breadth of integrated wireless choices, and unsurpassed common accessories and consistency with the entire enterprise notebook line. With total cost of ownership in mind the HP Compaq tc4200 Tablet PC is the ideal choice for enterprise-wide deployment to highly mobile users desiring innovation and versatility. Mobility: This ultraportable, power-packed tablet adapts to the way you work, simplifying the on-the-go professional experience. Plan for all-day computing using the uniquely designed HP Travel Battery2 , offering the convenience of charging while docked and providing up to an additional 4 hours of battery life. Recharge quickly with HP Fast Charge Technology, which recharges the battery up to 90% within 90 minutes. And, with enhanced standby time (up to 1 week), you'll be mobile and productive for days on end. Versatility: This sleek tablet PC offers a 12.1-inch display with wide-viewing angle on anti-glare protective glass and has a digital eraser pen with tether and clip, so you can write more like an actual pen. Mobile users will appreciate the performance and extended battery-life of this tablet. Users also choose the integrated industry standard wireless1, technologies that work best for them. The optional HP External MultiBay II2 allows users to utilize a variety of optical drives or a second hard drive2 for increased storage capacity and data back-ups. Security: HP ProtectTools provide enhanced security capabilities to help protect against unauthorized access to networks and business critical data and enable IT managers to manage their security solutions in a simple, easy-to-use manner. HP Drivelock helps prevent the data on your hard drive from being compromised even if your computer is lost or stolen, and optional integrated Smart Card Reader and a TPM Embedded Security Chip are available. Norton AntiVirus software comes standard with this tablet. Ease of use: This tablet PC display features an easy-to-use scroll up, scroll down and enter jog dial as well as pen activated programmable buttons, as well as an ambient light sensor that optimizes panel brightness in changing work environments. The tablet PC attaches and detaches effortlessly to the HP Docking Station2 or HP Advanced Docking Station2 making your tablet a truly mobile desktop. 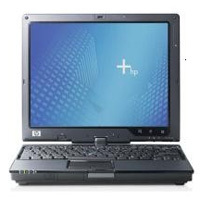 Reliability: The HP Compaq tc4200 Tablet PC is designed to meet tough business standards by providing users with a variety of reliability features and a durable design that will give them confidence in their computer. The HP Mobile Data Protection System helps protect the hard drive from shock and vibration and helps reduce the risk of data corruption. Combined with scratch-resistant in-mold lamination, a spill-resistant keyboard and the HP Panel Protection System that helps prevent the display from scuffing and scratching, your tablet PC will look newer longer. Connectivity: Wireless connectivity and enhanced battery life help you get connected and be productive wherever your work takes you. This tablet PC's dual antennas help you work efficiently with a more reliable connection to your network. 1 Easily identify, manage and turn on and off your wireless devices using the HP Wireless Assistant, optimizing battery life. 1. Wireless access point required and is not included. Availability of public wireless access points limited. Wireless Internet use requires separately purchased service contract. Wireless Internet use requires separately purchased Internet service contract.